PARIS — Ni Patrie, Ni Patron. Ni Le Pen, Ni Macron. The words appeared in graffiti and painted on posters in the streets of Paris the day after the first round of the presidential election. Unable to hide their anger and despair, hundreds of Parisians went down to Place de la République. There, they burned electoral cards and French flags, claiming to no longer recognize their country and its democratic values. “Where is democracy if a far-right candidate makes it to the second round?” asked a young girl, who had covered her face with a scarf and waved a communist flag. I wondered, for a moment, how we got here. How did the definition of democracy get so narrow among my peers? For those of us voting for the first time, the first round of the election, on April 23, was a long-awaited opportunity to express our opinions and be involved in the political life of our country. And we had a wide range to choose from. The election’s 11 candidates spanned the spectrum of French politics. But the result, for many of us, was a blow. We couldn’t claim to be surprised, but we nonetheless came to class the next day with bitter faces and knots in our stomachs. Marine Le Pen, a far-right nationalist, had obtained close to the same level of support as Emmanuel Macron, a centrist candidate considered by many to be in thrall to the banks and a continuation of the status quo. Their rivals on both sides of the spectrum, but especially on the left, had been thrown out of the game. In this tense climate, there’s the risk of massive abstention, especially among the youth. Social networks have played a major role in the emergence of this trend; the hashtag #SansMoiLe7mai (“Without me on May 7,” the date of the second round runoff) went viral on Twitter on election night. A Facebook event called for anyone feeling unsatisfied with the first round result to join a march against the Le Pen and Macron. These protest movements were mainly launched by far-left activist groups, such as “Ungovernable Generation” or “Inter-fight Independent movement” (MILI), and most people taking part in them are left-leaning and young (many of them voted for the leftist candidate Jean-Luc Mélenchon in the first round). They call themselves “The Disobedient.” The protestors believe in the need for deep structural change, an end to the Fifth “hyper-presidential” Republic and the restoration of social justice. They paint themselves as a bastion of resistance against a choice imposed upon them. Neither candidate represents them, they say. Mélenchon and Le Pen might share similar policy proposals — both have populist messages, a similar stance on Europe and an adversarial relationship with mainstream media — but for the Disobedient, it’s Mélenchon or nothing. Macron, widely expected to defend the interests of the governing bureaucratic elite, is not a viable option either. Supporters of former conservative candidate François Fillon have also threatened to stay silent on May 7. These largely middle-class voters pay the largest share of taxes and are attached to principles of meritocracy and economic liberalism. Although they have not been as active on the streets as their leftist counterparts, young Fillon defenders denounced the outcome of the first round, accusing the media of discrediting the candidature of all right-wing politicians, even if they are more popular. The reports of the scandal that sank Fillon’s campaign, they argue, were released with the sole purpose of eliminating him from the race. To them, Macron is too “socialist” and Le Pen is too extreme. By refusing to cast their vote, young French abstainers hope to sway the final outcome. If turnout is low, the result won’t be fully representative, and the elected president will lack legitimacy. Perhaps there is some logic to their argument, but to me, and many of my peers, their solution reflects nothing but laziness and resignation. Of course, there’s something romantic in barricades and revolutionary songs. But what are the Disobedients really proposing? How do they expect to be taken seriously if they don’t take a constructive, proactive approach to political change? By abstaining, they are shrugging off not their precious right to universal suffrage but any responsibility for the outcome of their decision. The truth is that, even in not voting, they will be contributing to the victory of one candidate or the other. Indeed, large-scale abstention would favor a Le Pen victory. Fortunately, however, not all young people share this vision. Many recognize that the “neither-nor” position is hypocritical. This vote is not about choosing between Scylla and Charybdis, it’s a question of responsibility. We have the opportunity to make things change, in one way or another, by not yielding to the temptation of indecision and cynicism. If we don’t vote, we’ll have only ourselves to blame. 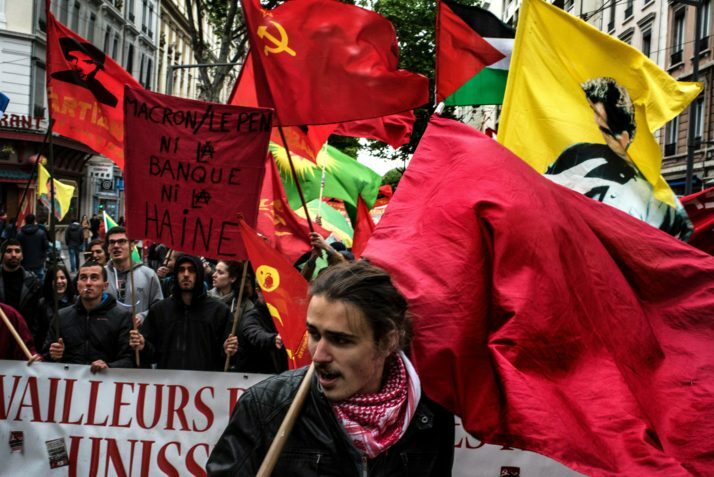 If French youth care about democracy, they can’t give up on politics. Tatiana Serova is a student at the Paris Institute of International Relations.